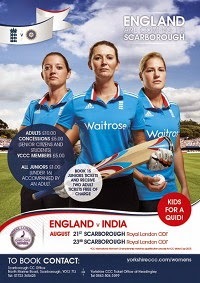 England Women are playing India in two ODIs at Scarborough in North Yorkshire next month; and even though Scarborough is a Fair old trek from Wokingham, I'm going - I've booked my Scarborough hotel room and paid my Scarborough train Fair! Anyways... having paid almost £300 for travel and accommodation, I was keen to get my tickets for the games. I know women's ODIs don't sell out very often, but when you've paid that much, you don't take your chances... right? "Tickets are not available online." Yes, you read that right - it's 2014, and tickets are not available online! But at least (the web site tells me) there is a "Ticket Hotline" open during "normal office hours". So I called the ticket hotline today, only to be told that tickets are not available over the phone either. "You can buy them on the gate!" I was helpfully informed. Have I landed in the middle of an episode of Fool Britannia? We're having a cricket match - would you like some tickets? WELL YOU CAN'T HAVE THEM! HA! HA!! HA!!! HA!!!! HA!!!! !